1. Halve each chicken breast vertically lengthways. Cut each length at a slant into 4 smaller pieces so that you end up with 24 pieces of chicken. Space the chicken on a sheet of clingfilm. Cover with more clingfilm and tap the pieces firmly with the end of a rolling pin to flatten them. 2. Scoop out the soft pulp from the preserved lemon and discard. Chop the peel into small dice and combine with the capers, parsley, garlic, sugar, olive oil and pepper in a bowl large enough to hold the chicken. Stir in the chicken pieces until coated in the mixture. 3. Line a large baking sheet with baking parchment. Thread the chicken onto cocktail sticks and space slightly apart on the baking sheet. Cover loosely and chill until ready to cook. 4. To serve, preheat the oven to 190°C, gas mark 5. Bake the chicken for 15 minutes until there is no pink meat. 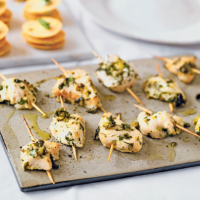 Transfer to a board or platter and serve sprinkled with extra chopped parsley over the top.